Remaking Malaysia: Is the end near for Umno? I had always thought Umno would never disappear. That somehow, this grand old political party of Malaysia can ride out whatever turbulence and turmoil it faces. And the party has had its share of turmoil in the past and overcome them. But after the Sabah Umno exodus, I am not so sure anymore. To be safe, as a political observer, I will just say I don’t know. As I write this, the breaking news is that the mass exodus of leaders from Sabah has begun — and it looks like it won’t stop. Even Datuk Seri Salleh Said Keruak and Tan Sri Pandikar Amin Mulia — both of whom were Datuk Seri Najib Razak’s staunch loyalists — have quit. What is happening in Sabah, an old friend tells me, is nothing new, citing instances of turnarounds, walkouts and jumping ship in the past. “It’s not uncommon in Sabah that a person is a Party A member in the morning only to be a Party B member in the evening,” according to this friend, who was a strong Umno supporter a couple of years ago. It does not matter if he is right or wrong. For now, the two big questions are is this the beginning of the end for Umno and can it survive this challenge? For a start, many mid-level party leaders, several division heads and their committee members echo what my friend said — that it is normal for politicians in Sabah to party hop, especially now that Umno and Barisan Nasional (BN) are no more in power. They claim to understand why their comrades did what they did as Sabah — although it is now under Pakatan Harapan (PH) — needs to have strong government representation at the federal level and in parliament to develop the state, which is lacking in many socioeconomic aspects compared with states in the peninsula. Sabah is not a state that can survive being in the opposition, like Selangor or Penang used to be. But at the same time, party loyalists are saying that Umno will not stop “this kind of members from leaving the party, people who turn their backs on us during trying times, and who backstab us”. There is bitterness, obviously. They proudly say Umno is alive and the party president has his plans but it will take time to rejuvenate the party. But political observer Hishamudin Ubaidulla sees the current situation in Umno quite differently. It is bleak, he says, and it could get bleaker. To political analyst Dr Sivamurugan Pandian, Sabah could be the beginning of a bigger movement towards rebuilding a Malaysian political coalition, piling on pressure within Umno for its leaders in the peninsula to follow suit in leaving the party. He says it could also lead towards a better direction from a different leader. Datuk Abdul Rahman Dahlan, a former federal minister from Sabah Umno, says the lack of direction caused the exodus in the state. Umno’s “lack of direction” is blamed on party president Datuk Seri Zahid Hamidi. Almost everyone would agree that party president Zahid must shoulder the blame for this lack. And one Umno man who has frequently pointed this out is Khairy Jamaluddin who, together with Tengku Razaleigh Hamzah, took on Zahid for the presidency earlier this year but lost. Incidentally, Rahman is a strong supporter of Khairy — at least when both were in Najib’s cabinet. As Hisham sees it, the Umno narrative of ketuanan Melayu in the past decade was becoming a divisive factor in Sabah and PH’s victory meant Umno Sabah was irrelevant as far as politics in the peninsula was concerned. In Sabah, he says “MA63 is the top priority. They had to have a clean break to be relevant in that negotiation”. MA63 refers to the Malaysia Agreement of 1963, which the PH government has agreed to review so as to restore the status of Sabah and Sarawak as equal partners with Peninsular Malaysia. There are views that Bersatu can be a big player if it enters Sabah, now that it is already in Sarawak. But the big political question is whether there is a need for Bersatu to enter Sabah’s political fray. 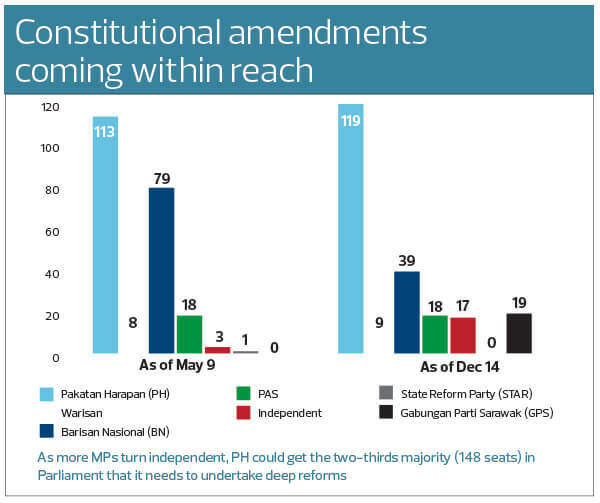 Shouldn’t PH rely on Parti Warisan Sabah, or Warisan, to be its representative or voice there? Warisan, founded by former Umno vice-president Datuk Seri Shafie Apdal, secured an electoral pact with DAP and PKR for the May 9 general election and Warisan became part of the federal government coalition when PH won GE14. Siva says PH should allow Warisan to play that role but “Bersatu might want to be seen as taking over Umno’s role in the state”. The Umno B could very well be an alternative to Umno. Mahathir has said that Malaysia, in particular the Malays, had always needed Umno to take care of their interests. However, it is not the present Umno that the Malays can depend on; to Mahathir, the “real” Umno ceased to exist when the party deviated from its original struggle. Enter Bersatu to fight for the Malays and bumiputeras. 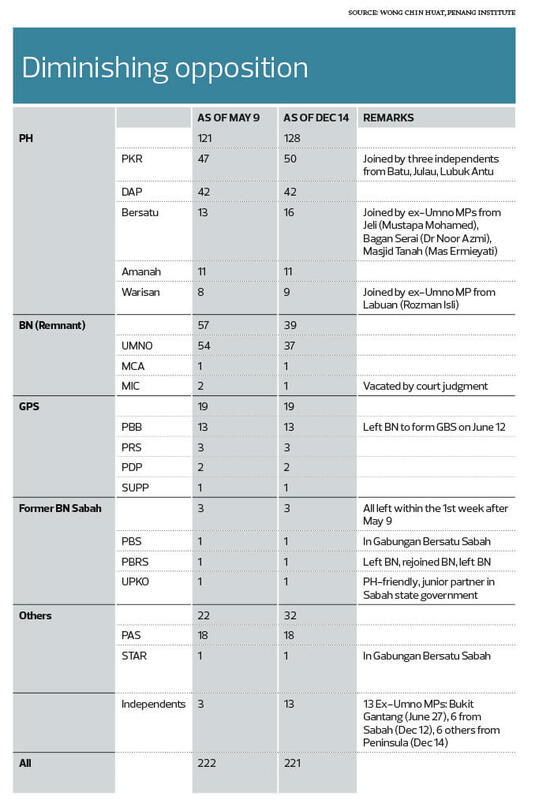 For now, the big story is that Umno is in deep trouble, to put it mildly. When several big names like Datuk Mustapa Mohamed quit Umno a few months ago, an Umno exodus was expected. That did not happen ... well, actually it did, albeit slowly and gradually, and not in the dramatic manner many had envisaged. But now the Sabah exodus has triggered another round of speculation. There are political murmurs that more resignations will come and this time, it will be in the peninsula — a sort of domino effect, in small groups of five or six at a time. This is already happening.Will it bring the curtains down on Umno? Are there many leaders left who want to rebuild the party? Indeed, these are interesting times.